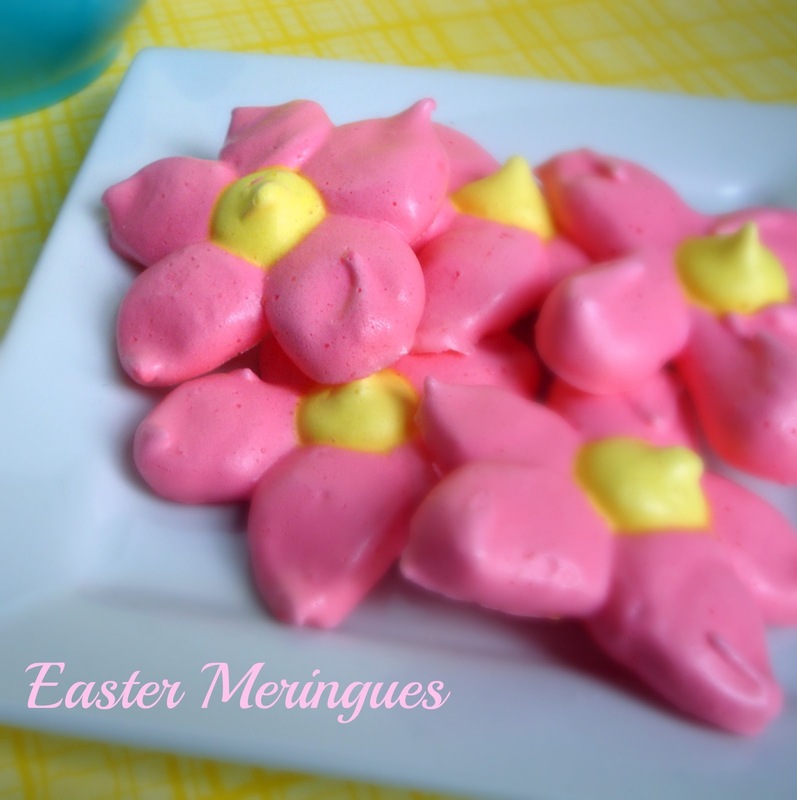 Easter Meringues - Chocolate Chocolate and More! My favorite thing to make with extra egg whites is Meringue cookies or Forgotten cookies. And since I made 3 batches of Cream Cheese Cinnamon Rolls in the past week, I had leftover egg whites. We love these cookies. Low in fat, you can control the sugar, add flavors, color them, shape them or just drop them onto a cookie sheet. We’re going to be out of town for Easter this year and since my kids are getting older, we don’t have to have all the goodies Easter morning….as long as they still get goodies, they’re happy. I had 3 egg whites so I tripled the recipe. Beat egg whites just till frothy, Add Cream of tartar, sugar and flavoring to egg whites. I used lemon flavoring for this batch. Beat just to combine. Separate 1/3 of egg mixture to another bowl. Now add your food coloring as desired. You can really use any color combinations you want. Continue beating each bowl of egg whites until stiff and when you lift out beater, peaks form. Snip off a small corner and start squeezing out onto a parchment lined cookie sheet. It takes a little practice but don’t worry, someone will eat the practice ones. 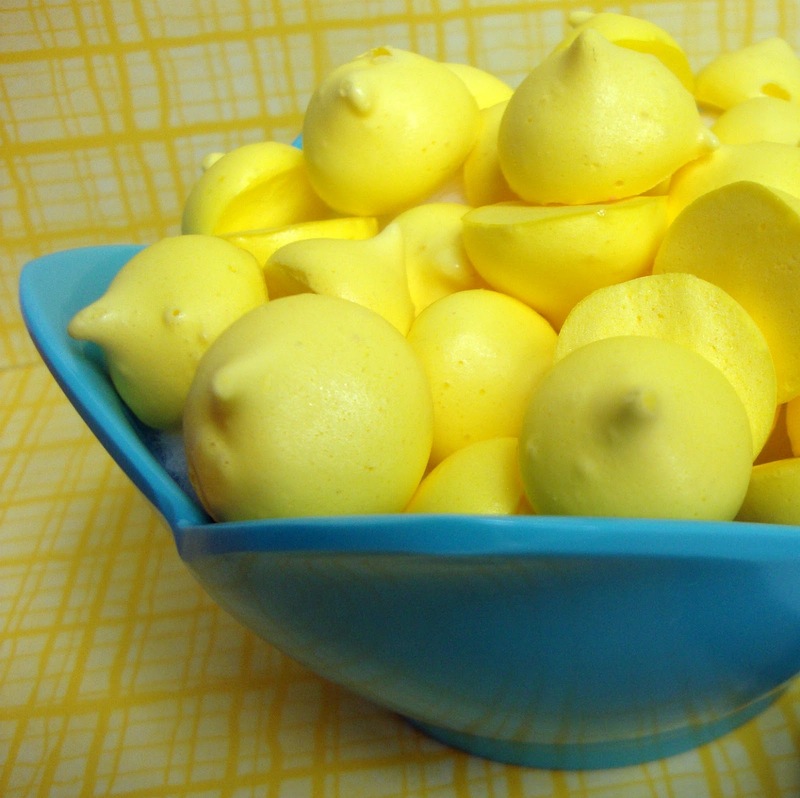 I ran out of pink so I made little lemon drop bites with the remaining yellow. Bake in a preheated 225 degree oven for 30 minutes then turn off the oven and leave cookies in for at least 2 hours or overnight. The flowers are fun but hubby loves the little bites, he can just nibble, nibble, nibble. Oh how adorable!!!!!! I love meringues… my low cal cookie! Oh, I love meringues! I am in love with the bright fun colors. I hope you will link up to my Hippity Hop Easter Project Hop. I Love meringues and these are such cute cookies! Great for Spring! These are beautiful! And so fun! Joan, these are so beautiful and perfect for Spring! Love to make meringues and they’re yummy, too! The only sweetener I can use right now is liquid stevia. Can I use that? Will that affect the texture, or not allow it to set properly? I’ve only ever worked with the granulated stevia but the liquid should work just fine. If you have trouble getting stiff peaks with your egg whites, add a little more cream of tartar.